These jackets are a great way to show off your organization! They are fully lined, have slash pockets and snap closure. 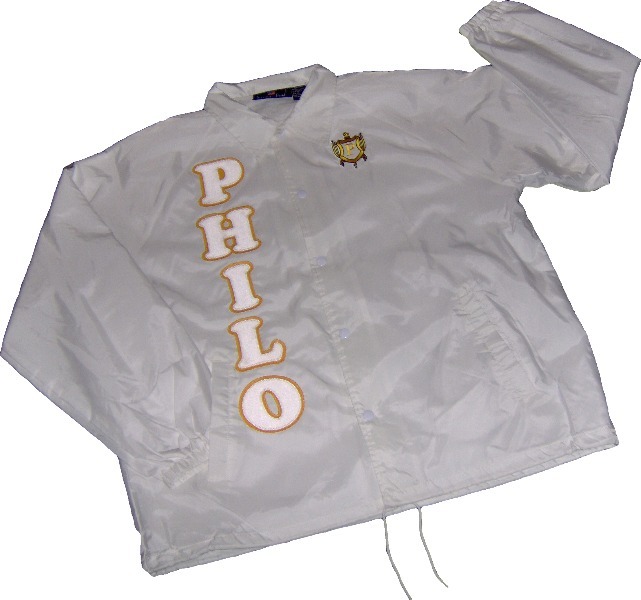 "Philo" is spelled out on the right side and the Philo shield over your heart. Choose from white, gold, khaki, or black jackets. The khaki jackets are unisex sizes, and run large, so order accordingly. Standard embroidery around crest - "Friends of Sigma" on top, "1943" on bottom. Khaki jacket shown above - yellow gold letters, white letter BACKGROUNDS. White jacket shown to the left - white letters, and yellow gold letter BACKGROUNDS.